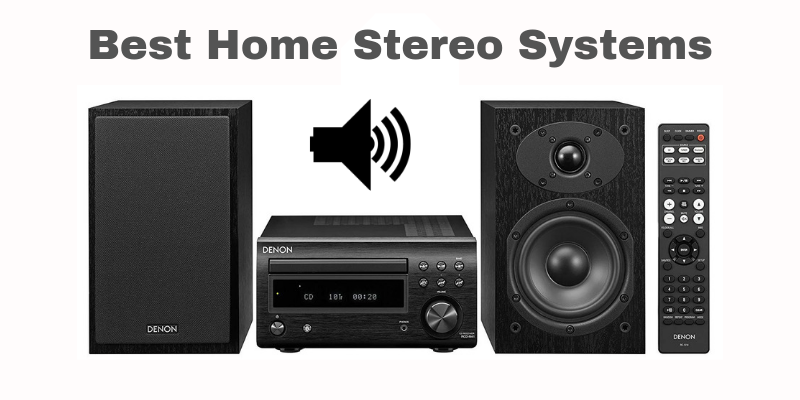 Are you looking for a great home stereo system? Are you confused by the number of products available? Does all the tech-speak the manufacturers use to describe their products leaving you scratching your head? If the answer to any or all these questions is a resounding yes, then you’ve come to the right place. In today’s round-up we’ll be reviewing the best home stereo systems on the market and comparing their functions and sound quality. We’ll also be informing you of the pros and cons of each product. 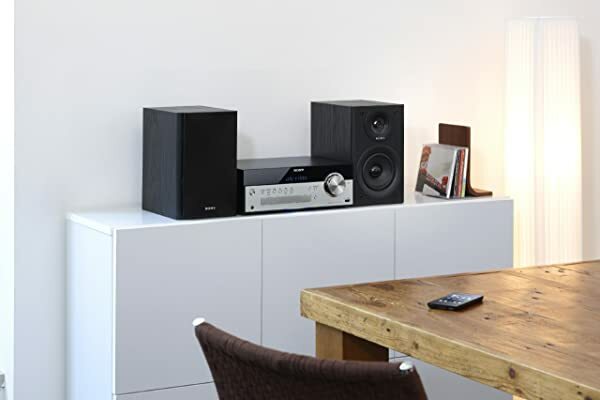 As well as letting you know what, in our opinion, is the best home stereo system you can buy. All these stereo systems are perfect for any music lover who is looking for excellent sound quality, with great features. The Sharp XL-BH250 features many listening options including Bluetooth, USB for mp3 playback, 5 CD player and AM/FM audio with 40 presets. It’s capable of producing good sound quality, with a nicely detailed stereo separation and enough volume for most uses. The sound is very detailed and crisp. 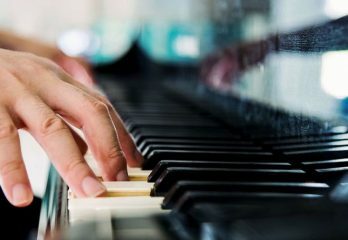 The treble frequencies sound bright and defined without any harshness. The bass does what bass should, hits hard and goes down low. They do, however, lack some low-end bass response due to not having a dedicated subwoofer. The Sharp XL-BH250 has a sleek design that blends in nicely with modern interior décor. It will look good wherever you put in your home, office or work. It’s compact size also means it will fit in most spaces. 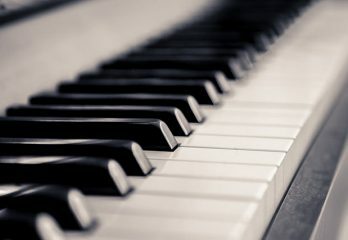 The USB and Bluetooth connectivity works like a charm and allows you to play music via any mobile device easily. The AM/FM radio tuner features 40 station presets and allows you to set your favorite channels for one-touch recall. The system comes with an audio line-in to connect any external players or devices using a traditional cable, as well as a USB input. It also features a headphone output if you fancy some alone time with your music, without bothering the rest of the household. The volume controls and LED display are positioned at the front making the unit very intuitive to use. It is also supplied with a basic remote control if you would rather control it from a distance. Overall, it’s a versatile home stereo system that delivers a good combination of sound quality and functionality. The product description quotes the unit having an optical audio in, but it doesn’t. Many users have reported that they are not happy with the quality of the speakers. The Sony CMTSBT100 home stereo system provides great sound, stylish looks and the build quality the company has become famous for. It pumps out 50 watts (RMS) of power with Sony’s exclusive S-Master amplifier driving the dual two-way bass reflex speakers. Full AM/FM radio capability is also available, together with USB and Bluetooth streaming. And for those who still use CD’s, a CD player is also included. All this adds up to a really versatile home audio system. The sound quality you get from this system is very consistent through many music genres, with crisp highs, detailed midrange, a good bass response, and decent stereo separation. It’s bass reflex speaker design giving far more low end than the Sharp XL-BH250 we’ve just reviewed. The USB port features a 2.1 charging capability so you can use it to charge your iPad or any mobile device. It’s NFC connectivity works well and remembers the last paired mobile device. 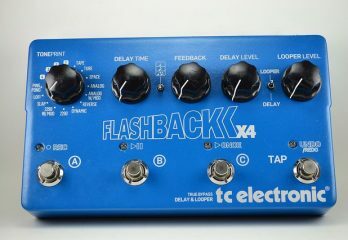 The system uses old-school style bass and treble adjustment knobs which help to fine tune the EQ settings. These are far easier and more intuitive to use than trying to equalize your music with digital menus. 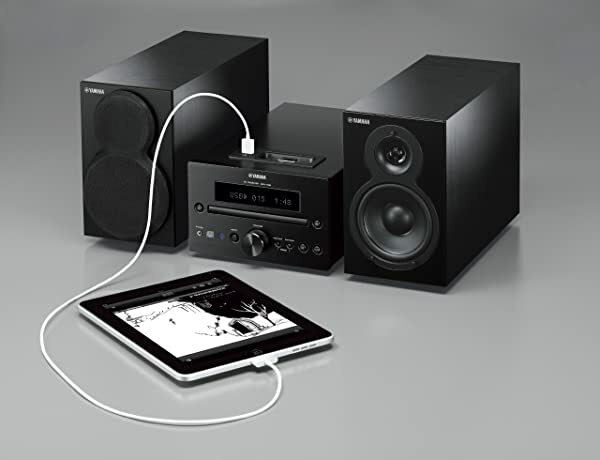 The Sony CMTSBT100 comes with a 3.5mm audio input jack, for all your wired connections at the rear of the speaker, and a headphone output jack in the front. You also get a handy and intuitive remote control. 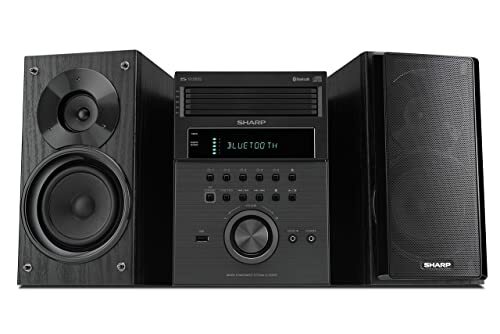 Overall, this home stereo system offers versatility with modern looks and delivers good quality sound, which makes the Sony CMTSBT100 an excellent choice for many buyers. Old-school bass and treble knobs. Only reads 250 songs, which is fine for CD’s but not for flash drives that contain more than 250 songs. Many people have noted that they are disappointed with the sound quality. The Yamaha MCR-232BL is a high-quality stereo system that delivers exceptional stereo sound for home audio entertainment in an elegant modern design. It features 2 two-way bass reflex speakers for deeper sounds. These use Yamaha’s VCCS technology ensures that the speakers accurately reproduce the sound, without any distortion or static interference. Designed to be sleek and unobtrusive, it blends in nicely with modern home interior décor. The central units matt black finish contrasts well, with the matt black speakers that show the grain of the wood. The speakers sound excellent, with a two-way bass reflex design producing crisp highs, good midranges and a stunning amount of bass. They feature elegant removable grilles so you can vary the look of the system, depending on your personal taste. It’s a great system to play loud! With no loss in sound quality or distortion when the volume is turned up high. The sound remains consistent and very well defined throughout the entire volume range. As with the Sony we’ve just reviewed, it features bass, treble and balance controls which allow you to adjust the EQ settings and get the right and left speakers balanced nicely. The Yamaha MCR-232BL sounds crisp and vivid, with detailed instrumental separation and a very good soundstage. It’s creamy, smooth, sweet and well-balanced, and at low volumes, the clarity of the sound still remains consistent. The system also features a subwoofer output to add a dedicated subwoofer for even more bass if necessary. The subwoofer itself is understandably not included. The central console features an iPhone and iPad docking station, so you simply place your iPhone or iPad in the dock and listen to your playlists without any more effort. It will even charge your iPhone/iPad at the same time. It also features a USB input and supports mp3 as well as WMA file formats. 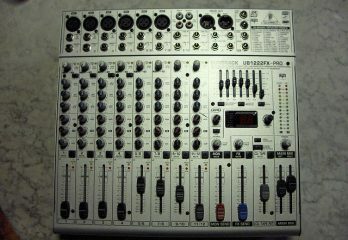 The system also comes with analog audio inputs and outputs for further connectivity. The system doesn’t, however, feature Bluetooth connectivity, so if you are looking for that, you will need to check out one of our other options. 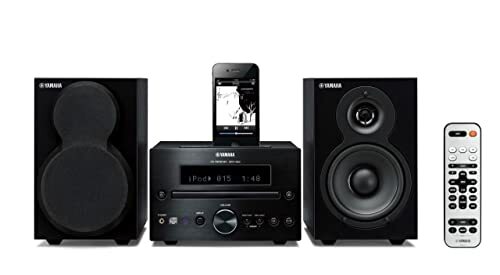 Overall, the Yamaha MCR-232BL is easily one of the best home stereo systems you can buy and delivers great sound quality, stylish looks and a lot of functionality. Ability to connect a dedicated subwoofer. Many buyers have reported problems with playing certain CD’s. The Onkyo CS-265 stereo system delivers really detailed sound, with nice treble and mids for crisp tonal clarity and good bass response. It’s compact in size but is capable of pumping out 40 watts in total, so should be loud enough for everyday use. Featuring a two-mode super bass function which allows the user to enhance the low-end frequency response if needed to best suit the location of the unit. It also has tone controls for the treble and bass, as well as bass presets which allow you to adjust the EQ settings to your personal preferences. The CD player supports audio CDs and CD-RW formats (either with mp3 or WAV encoded files). As well as featuring a sturdier CD tray which loads CDs quicker than the other stereo systems we have tested. 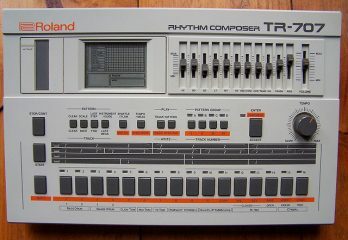 It also has three playback modes for the CD – normal, random and repeat modes. It has an analog input to connect external devices at the back of the speaker. The USB port easily connects to iPhone and other mp3 players. It also features Bluetooth 4.0 for wireless music streaming and NFC connectivity so it will remember the last paired device. Overall, the Onkyo CS-265 is a robust home stereo system with a good sound and some nice features. Super bass function allows bass frequency enhancement. Replacement remotes are not sold, so if you lose or break it, all dedicated remote functions will not be accessible. 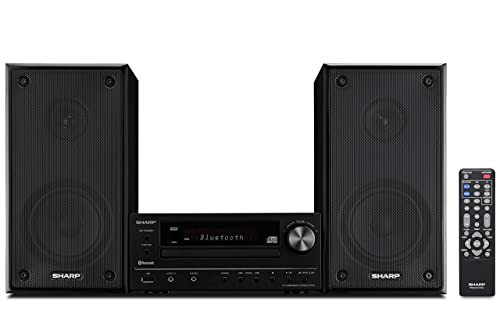 The Sharp XLHF102B is a good home stereo system that delivers good bass performance and a crisp stereo sound. 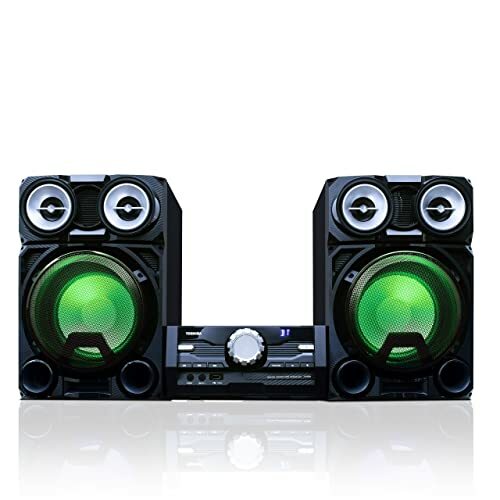 It has a well-defined stereo image and provides a total power output of 50 watts. Regarding the functionality, it features a CD player, Bluetooth wireless streaming capability, a USB input with mp3 and WMA playback, a headphone output, AM/FM radio and a remote control. The entire system looks great and features more of the old-school, intuitive to use dedicated bass and treble controls, found on the other systems covered. It also has a bass boost and X-Bass functionality which increases the lower end frequencies, making it superb for listening to bass-heavy music genres. The bass feels solid and doesn’t get muddy. And if you want even more of it, you can, by connecting a separate subwoofer through the units subwoofer output. The subwoofer itself is not included with the Sharp XLHF102B. The radio functionality is good, with every AM/FM station sounding consistent without any distortion at high volumes. 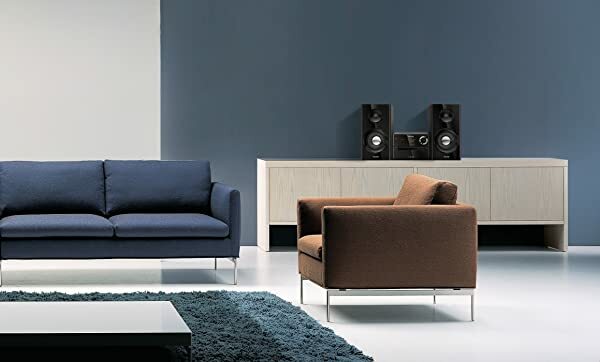 It’s well designed with solid construction featuring a metal case on the central unit and speakers which are made of solid MDF with metal grills. This prevents the speaker cabinets from resonating at higher volumes and reduces total distortion. The Bluetooth connection works without any issues allowing effortless pairing to any compatible devices for direct music streaming. It also features two auxiliary inputs – a traditional RCA at the back and a 3.5mm input at the front to connect all your external devices. Bass boost and X-Bass functionality. Dedicated subwoofer output if needed. Many users have reported problems with the display malfunctioning after some time. The Philips BTM2180 is a quality home stereo system that comes with all the functionality you need for a great home audio experience. It features with a CD player which is compatible with CD mp3 files and CD-R/RW formats. Along with Bluetooth streaming, a built-in USB and audio-in connectivity for you to plug in your portable mp3 player. The built-in bass reflex speaker enhances the low-frequency response. The speaker design uses a bass pipe that is acoustically aligned to the woofer which optimizes the bass roll-off in the system. This produces more controlled bass frequencies with lower distortion. The speakers also feature dome tweeters which produce crisp highs and detailed midrange frequencies. The sound produced by these speakers sounds crisp and clear, with an added punch given to rock and pop genres due to the bass reflex design. They are also loud and provide a reasonable volume level for the 70 watts (RMS) of power. You can really crank up the volume when needed without getting much distortion, the sound quality remains consistent throughout all volume levels. 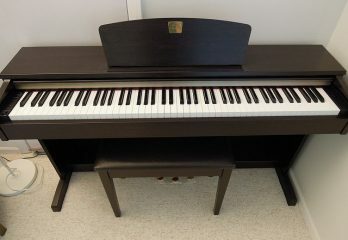 It has digital sound control, which is used to adjust the EQ settings. With each mode using graphic equalizing technology, to adjust the EQ according to the chosen preset. The Philips BTM2180 comes with audio-in connectivity, for connecting external devices with a cable, as well as USB direct input for flash drives, etc., and Bluetooth wireless streaming compatible to all Bluetooth smartphones, tablets, and other devices. 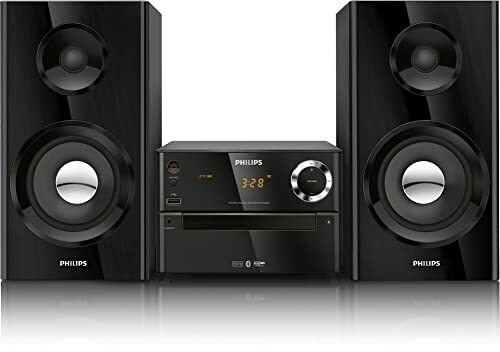 Overall, the Philips BTM2180 is a robust home stereo system with great sound and versatile features. Problems with playing some CDs. 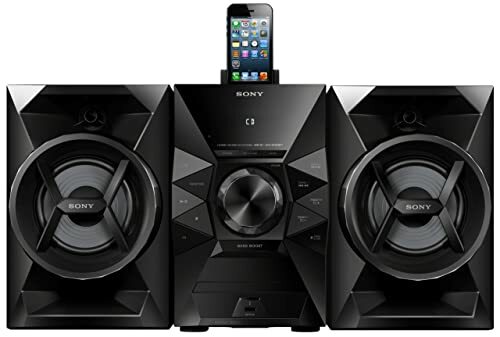 The Sony MCHE619iP is easily one of the best home stereo systems in its price bracket and delivers plenty of great features along with excellent sound performance thanks to its 120 watts (RMS) of power. Even though it is compact in size, it has been built to rival larger, more complex stereo systems. And produces more than enough volume to fill most rooms, so it will certainly add some punch to your home audio listening experience. The speakers use a bass reflex design which will enhance the low-end frequency response and give you more bass out of the micro system. If you’re a fan of bass-heavy music genres, you’ll enjoy this feature. The bass it produces sounds punchy without sounding muddy into the midrange. The audio quality is crystal clear, and up can turn the system up loud without hearing any distortion. The stereo imaging is also superb. Now to some of the features, which is where the Sony MCHE619iP excels then disappoints. The system comes with an integrated dock which provides convenient charging and playback control for devices using the Lightning connector such as iPhones. It also has a convenient USB on the front to connect to USB thumb-drives, flash drives, older iPhones (without lightning connection) and other compatible USB devices. There’s also a CD player, which is compatible with CD’s, CD-R and CD-RW discs, as well as mp3 files that have been recorded to these CDs. It also features an FM radio. The big downside to this system is that it lacks Bluetooth connectivity and an auxiliary input jack. So you can’t connect any device wirelessly to it, nor any device that uses a mini jack input. So you’re basically stuck with devices that either work with lightning connectors or USB. Apart from this minor niggle to some (major to others), the Sony MCHE619iP is a good home stereo system with excellent sound performance. Some users have noted reliability problems. The Panasonic SC-UX100 is a loud beast, delivering up to 300 watts (RMS), which should be more than enough to please even the biggest party animal. The speakers feature a 13cm woofer which enhances the low-end frequency response as well as a 5cm tweeter to give crisp highs and a well-defined midrange. 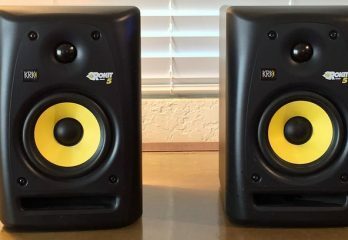 The speakers are however larger than most of the ones featured in this review, so would not be referred to as bookshelf speakers. With plenty of power and the large speakers, this system obviously delivers in the low end. It not only goes lower than most of its competitors but does so without losing clarity in the bass. The Panasonic SC-UX100 looks fantastic, featuring a luxurious minimalist design with a matte black finish and polished accents. The equalizer has preset settings to match certain genres of music, so if you want to listen to pop just press the pop preset and see if you like what you hear, the same goes for many other genres. It also has a feature which is called the DJ Jukebox, which will make it the life and soul of any party. The EQ presets, and DJ Jukebox can be fully controlled by the free downloadable App which was created to be used with this system. If you are looking for volume above anything else, the Panasonic SC-UX100 with its 300 watts is a great choice. Plenty of power at 300 watts. Speaker wires are quite short, you may need to add more for longer runs. This Toshiba Mini Component System is seriously loud. If you thought the Panasonic we just covered was loud, sit back and hear the noise. This monster is 800 watts, that’s four channels of 200 watts each!. It’s got all the standard features which you have come to expect by now as well – streaming Bluetooth, CD Player, FM radio, MP3 USB and an Aux Input. Toshiba has been designing some of the world best audio technology for over a hundred years and developed this mini system to stream, connect with, or play multiple mediums. This system allows you to play multiple CD formats or an MP3 device, browse local FM radio stations, plug any external device in via the auxiliary input or the USB, or stream your favorite tunes or a podcast through Bluetooth on any smartphone. Need to Pump up the party? No problem, there are integrated LED DJ party lights in each speaker. When the system is playing music, the lights flash to the beat giving you not only volume but a light show at the same time. 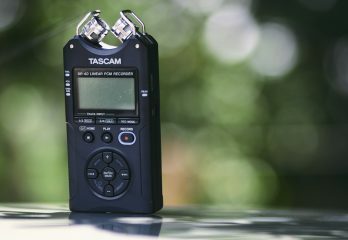 And even though it’s got more than enough power, it has also been designed to be compact and portable, for a high-quality audio experience wherever you go. Keep it at home on a bookshelf, then when it’s party time, pack it all up and get ready to DJ like the best of them. The modern world is all about multi-tasking, and Toshiba has considered this by including an easy-to-use remote control. So, you can easily switch from your favorite FM radio station to your yoga relaxation CD to a streaming podcast via Bluetooth, at the touch of a button without even needing to leaving your chair. Disco lighting for those who want to live the 70’s vibe all over again. The manual mentions that the unit is prone to ‘heating up’ and not working properly. It states that this isn’t a ‘failure’, but normal. This means that unfortunately when you change from setting to setting you may lose one of the speakers. To fix this issue, the manual states that you need to power down the unit and unplug it, then leave it for a few minutes. This doesn’t really make it the best stereo system for a party. We are back down to normal wattage with the last of the best home stereo systems currently available – The Denon D-M41 stereo CD/FM receiver, the successor to the multi-award winning D-M40. 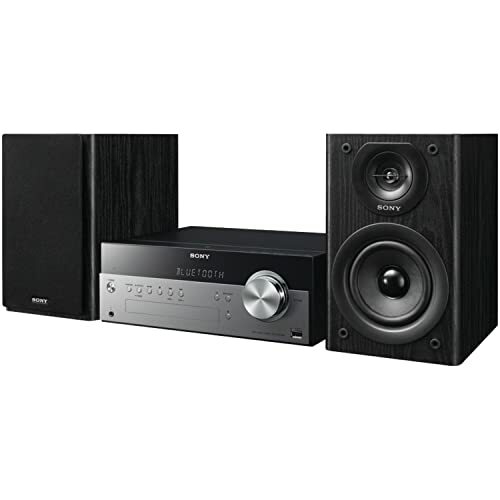 It’s supplied with a pair of SC-M41 bookshelf speakers, which are rated at 30 watts each. These feature a very high quality 4.75″ woofer and a 1″ high definition silk dome tweeter that produce a natural, smooth and powerful sound, which is ideal for small to medium-sized rooms. Its newly-developed discrete analog amplifier circuit creates greater clarity and impact, by reducing the signal path. It also has a triple noise reduction design which preserves the purity of the signal and eliminates distortion from three noise sources. This gives the system a more dramatic home theater experience. It looks sophisticated and stylish, the new cosmetic design echoing that of the high-end flagship Denon systems. It has two digital inputs, not the usual one. This allows you to stream your favorite tunes via Bluetooth AND connect your TV, set-top box or other sources for unmatched premium sound. It also comes with a dedicated headphone amplifier to enjoy personal listening without disturbing anyone else. You can even manually turn the Bluetooth functionality off. This is useful because even when you’re not listening to music using a Bluetooth connection, it can still influence the sound of other sources. If you want to immerse yourself in multi-dimensional audio with the highest quality surround sound, then The Denon D-M41 could be precisely what you’re looking for. Off-switch to turn off the Bluetooth signal. Many buyers have reported dead out of the box and reliability issues. Video and audio out can be out of sync when watching online videos because of Bluetooth delays. Before we move on to find out what’s the best home stereo system currently available. We thought we’d discuss volume and its perception a little. Volume is measured in watts, and our speakers range in wattage today from around 25 watts to a massive 800 watts. But the scale that is used to measure watts is logarithmic, not linear. What this means in practice, is that to double the volume of 1 watt you need 10 watts, so a 10-watt system would be twice as loud as a 1-watt system. But to get twice the amount of watts and twice the volume of a 10-watt system you would need a 100-watt system. And for double the volume of a 100-watt system you would need 1,000 watts, etc. etc. This is why when you go to festivals which have 1,000,000 watt PA systems no one leaves with bleeding ears, they would if the system was actually a 50,000 times louder than the systems we’ve covered here. So, in reality, as can be seen there is very little difference in volume, between a 40-watt, a 50-watt, and a 60-watt system. To get twice as loud as a 40-watt system, you don’t need 80 watts, you need 400! For example, the Sharp XLHF102B is rated at 50 watts, so for a system to be twice as loud, it would need to have 500 watts and twice as loud again would need 5,000 watts. The loudest system we covered, the Toshiba is rated at 800 watts, which as you can now see is just over double the volume of the Sharp. 500 watts would be exactly double, but to be one and a half times louder it would need to be 500 watts plus half the next divide (which is 5,000 watts), so it would need to be 3,000 watts. Since it is only 800 watts, it is in reality only just over twice as loud. Buyers think that a 100-watt system will be twice as loud as a 50-watt system and are disappointed when it isn’t, but as long as you remember that wattage is rated in a logarithmic measure, you understand and probably care a lot less about quoted wattage in future. So What Is The Best Home Stereo System For You? We’ve gathered together what are, in our opinion, the best home stereo systems currently on the market. They are all excellent choices, and any of them would make most buyers more than happy. Regarding many features, as you may have noticed, they are quite similar. They all basically do exactly the same thing after all. But, what does set them apart are certain features, the build quality, and how they sound. The more expensive models reviewed understandably sound better than the cheaper ones. It won because it offers the best over-all features for the price. It’s a mid-priced system, but we absolutely loved the sound. We also liked the way it looks, and it’s functionality. It doesn’t, however, feature Bluetooth connectivity, so if that’s important to you then go for one of our other choices that do. We believe the functions and the sound of the Yamaha more than make up for the lack of Bluetooth. Honorable mentions also go to the Denon D-M41 which was the best sounding system we tested, but a little on the expensive side and has some reliability issues. And to the Panasonic SC-UX100 for fantastic reliability and value for money. Have fun choosing the best home stereo systems and see you again soon for another round-up!